Featuring Gibson USA BurstBucker™ pickups, coil-splitting, Dethklok gig bag and more! Epiphone presents the Ltd. Ed. Brendon Small "Thunderhorse" Explorer Outfit, a one-of-a-kind signature guitar for one of the most eclectic and challenging artists working today. Do we mean Brendon Small? No! Dethklok, of course! Brendon Small is the co-creator and comedic--and musical--imagination behind Dethklok, the virtual metal band featured in the hit animated program produced by Adult Swim, Metalocalypse. And now with the "Thunderhorse" Explorer Outfit, Epiphone and Brendon have collaborated to create the ultimate 6-string weapon packed with exclusive features only found on Epiphone. It's a guitar worthy of "the world's greatest cultural force" and in the hands of Dethklok lead guitarist Skwisgaar Skwigelf, a serious and potentially lethal musical weapon to be reckoned with. Billions of Dethklok fans have already noticed the Epiphone "Thunderhorse" as the ultimate Brendon Small Signature Explorer and have declared it totally metal times infinity. The "Thunderhorse" comes with a premium-fitted custom gigbag with three "Dethklok" stickers that you'll only get from Epiphone. And of course, the Ltd. Ed. Brendon Small "Thunderhorse" Explorer Outfit also comes with the Epiphone/Gibson Limited Lifetime Warranty and 24/7/365 customer service. Turn your world totally metal, totally Dethklok. Don’t miss the Ltd. Ed. Brendon Small "Thunderhorse" Explorer Outfit at your Authorized Epiphone Dealer. The Ltd. Ed. Brendon Small "Thunderhorse" Explorer Outfit features a striking Silverburst gloss finish on a classic Explorer profile. Both the body and neck are mahogany. The 24.75" scale neck has a 1960's SlimTaper™ 'D' profile and is hand-set and glued-in for incredible resonance and sustain. The super smooth and super fast phenolic fingerboard--which can only be found on the Epiphone "Thunderhorse"-- has a 12" radius, 22 medium jumbo frets, a 1.68" nut, and pearloid dot inlays. The guitar has single ply cream binding on the body top and along the fingerboard. 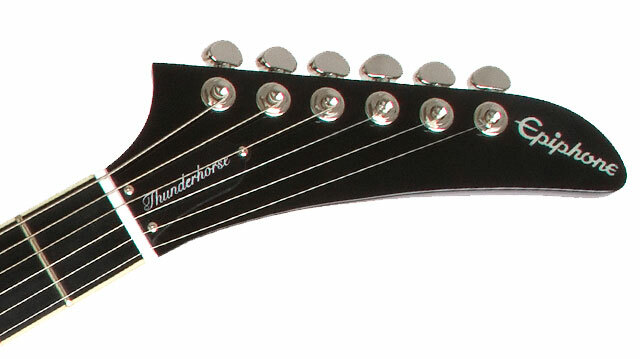 The classic Explorer truss rod cover on the Exporer headstock is black with "Thunderhorse" in silver silkprint. 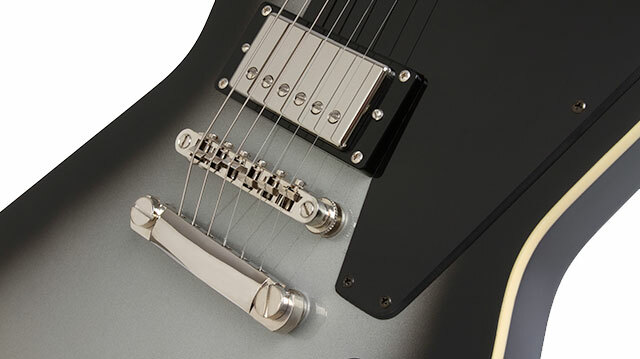 The "Thunderhorse" is powered by seriously cool Gibson USA BurstBucker™ pickups. 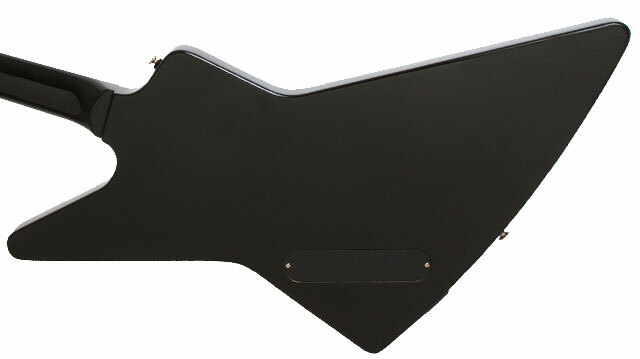 The neck features a Gibson USA BurstBucker™-1 humbucker and the bridge position features a Gibson USA BurstBucker™-2 humbucker that is slightly overwound to emulate the legendary hand-wound PAF humbuckers produced at the historic Gibson-Epiphone factory in Kalamazoo, Michigan in the late 50s. BurstBucker™ pickups are made with unpolished magnets and non-potted coils, just like the originals. This combination gives players subtle tone variations that make each Gibson USA BurstBucker™ humbucker - and your guitar - absolutely one-of-a-kind. And, you'll get even more power from the BurstBucker™ experience thanks to push/pull coil-splitting controls on the Neck Volume and Bridge Volume knobs, also an Epiphone exclusive. Epiphone and Brendon Small know that your axe is worthless (as in "not worthy") without high quality electronics. The Ltd. Ed. Brendon Small "Thunderhorse" Explorer Outfit includes Epiphone's non-rotating 1/4" output jack and an Epiphone all-metal 3-way pickup selector with a black toggle cap. Neck and bridge volume controls feature 500K linear potentiometers and the Master Tone knob is a 500K non-linear with 0.02uF tone capacitor. Hardware is also serious business at Epiphone and the Ltd. Ed. Brendon Small "Thunderhorse" Explorer Outfit features a LockTone™ Tune-o-matic bridge and Stopbar tailpiece combo, and Grover™ Mini-Rotomatic machine heads with a 14:1 tuning ratio.